Cut the courgettes into 1½ ins lengths the thickness of a little finger. Boil in a pan of water for 4 to 5 mins. Then place in cold water until cool. Drain well and dry on to kitchen paper. Cut the tomatoes in half and scoop out the centres. Dust with a little salt and turn upside down on a wire rack to drain. Place the courgettes in the vinaigrette and mix. Cut the tomatoes into strips keep some back for decoration. Add the rest to the courgettes. Place in a serving dish. 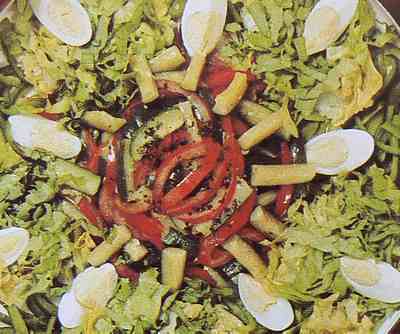 Place small piles of lettuce and peppers alternately around the edge of the dish. Quarter the eggs and place around the dish. Place the tomatoes in the centre and sprinkle with seasoning and the chopped basil.